Ms. Hendershot holds a medical assistant degree from Bryman College (now Everest College) and an Associate of Arts from Chabot College. She is a registered cardiovascular sonographer, a registered diagnostic cardiac sonographer, national registered certified medical assistant and a certified cardiovascular technologist. In addition to consulting, Ms. Hendershot lectures seniors and volunteers on heart health. Looking toward the future, she hopes to provide more services for those less fortunate. 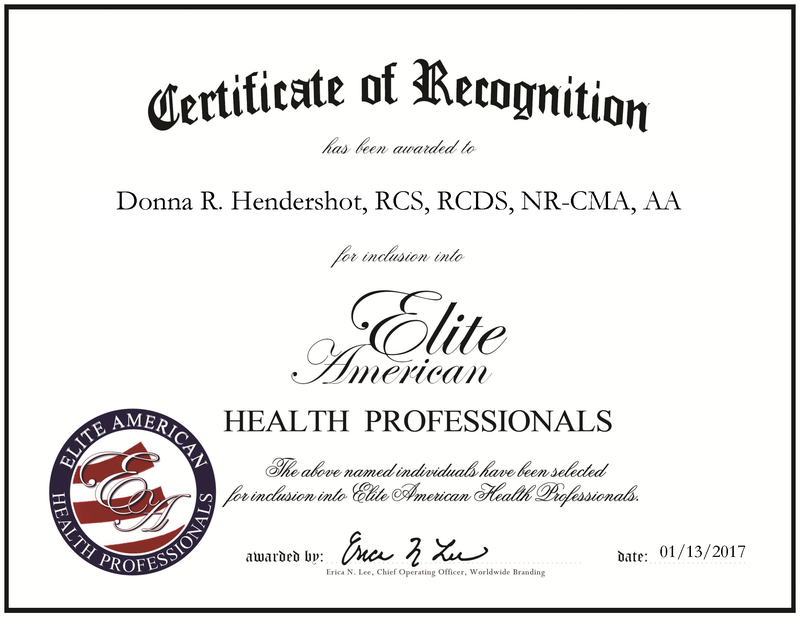 Donna Hendershot was originally selected for inclusion in Elite American Health Professionals in January, 2011. We are proud to be featuring Ms. Hendershot again in Elite American Health Professionals for 2017. This entry was posted in Cardiology, Consulting and tagged cardiac echo, cardiology, cardiovascular, consulting, electroencephalograms, sonography, supervisor. Bookmark the permalink.